quarrygirl.com » Blog Archive » sneak peak at doomie’s menu for the LA vegan beer fest! sneak peak at doomie’s menu for the LA vegan beer fest! today was a happy day in my email inbox, because i got a message from doomie’s home cookin’ about their potential menu at saturday’s upcoming LA vegan beer fest. 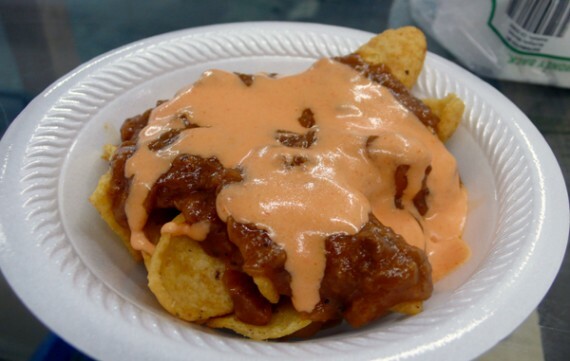 frito pie (ghetto style in the bag), jalapeno poppers, buffalo legs, shrimp cocktail shooters, shredded beef taquitos, sushi, vegan empanadas, rice crispy treats and MAYBE cupcakes with beer frosting (if there is a god). as a huge fan of all things doomie’s, this menu got me WAY TOO EXCITED! honestly, nobody makes vegan food quite like them, and they don’t participate in many events…so don’t miss this chance!! you can also order tickets right now online at ticketmaster! ticket prices for the LA vegan beer fest include unlimited beer and music. food is sold separately! this sounds amazing. last time doomie cooked at meet market i was blown away. doomie, beer, oh boy. c u there!!! I wish the tickets included unlimited food w/ beer sold separately!!!!! Yep that would turn this atheist into a believer. Please let it be so. OMG I cannot wait. That looks amazing. I’m not even worried about calories that day. Nothing can keep me away from that frito pie and jalapeno poppers. Hope they have cupcakes! Greg, I agree! When you don’t drink and free booze is included in the ticket price, makes you not want to go. This is never fair. Micki – I know, right?….I’m on the fence….talk me into it. Heh. Praise be to Tony’s and Quarry Girl. Chiptle sweet potatoe fries with maple glazed almonds. . . I Love you! The Makepeace Brothers were in a band called Oculus, which I used to go see a ton in college (they’re from my college town). They’re great. Also, what’s up with VIP tickets? We get in at noon, right? Do we have, like, VIP lines too? Oops, meant to post that on the OTHER post about beer fest. But you get the point! we got vip tickets and looking forward to go!!!! quarry girl, i want to introduce some of my new vegan friends there! I, too, am not going, on account of it being a horrible deal for non-drinkers. Oh well. Maybe I’ll walk up there and just visit the food trucks (finally they’ll be near me! ), and hopefully the lines won’t be crazy. Im not sure of the deal here so perhaps Quarrygirl can clarify . . . Is there access to the food trucks in the back lot without having to get a beerfest ticket? Damn. I guess I’m staying home tomorrow. I’ll try the food trucks someday… They’re never in effing WeHo! Look guys, it’s a beer fest. That happens to be vegan, which is great for us who are used to an animal-based bar food. However, if you don’t drink beer, too bad, so sad. Join LA Vegan meetups and find some other events that are more your style. Woulda been cool if they offered a “designated driver” type ticket for $5 or $10 that didn’t give you unlimited drinkage, but let you in to socialize and buy food. I don’t know how logistically tricky iy would be, but I definitely would have jumped at that. Would also have made me feel a little better about the prospect of sending a bunch of people out into the streets midafternoon w/ $45 worth of booze sloshing around in them. It’s called a bus or a cab – and that’s how we got there. I had some family stuff come up, so I couldn’t go – initially I was bummed out….but, had I gone – I was planning on just supporting the food trucks and buying food. Knowing that I would have been denied the opportunity to support vegan food trucks unless I paid $45 for beer i wasn’t going to drink kinda makes me glad I didn’t show up to find that out in person! Meredith, I’m not sure why you’re getting so defensive toward the non-drinkers. There aren’t that many big vegan gatherings/socializing opportunities, so anything that would have made this event more inclusive would have been nice….and there are obviously people who wanted to come and support it to some extent, but felt a bit silly spending a lot of money for a product they weren’t going to consume. @greg: you should have known without showing up in person that the $45 didn’t cover food. @qg: no one said they thought food would be free. some thought food might be available to those who didn’t buy tickets to the event, since trucks usually park on public streets, available to anyone who comes by. and if they’re just charging their normal prices, why fence them off? but whatever, veggie grill was better and not full of drinkers. Like QG said, it was a beer fest. I’m not getting defensive, just stating a fact. If you are interested in more vegan events and haven’t you should look into the Vegan Drinks meetup group. It’s just a get-together group, so you don’t have to drink to come – everyone is usually responsible for their own food and beverages. There are events at least monthly. Also, I went to another beer fest a few weeks ago with much of the same set-up – the food trucks were set up so only those from the beer fest could access them. Otherwise, separating those who are at the beer fest from those who are not gets to be a small nightmare, especially at festivals like this one with unlimited drinks rather than a ticket system. It would be very hard to set trucks up on the street in that part of West Hollywood. And besides, I think preference should be given to those who bought tickets to the festival for the food. So they were set up in the parking lot and you could walk out of the Roxy to access them, plus most of the beer. @daniel: you have no idea what you missed but i can guarantee you it was better than veggie grill which I’ve had dozens of times (no offense vg, i love you!). since we paid for access the benefit was that we didn’t have to wait in as long of a line.